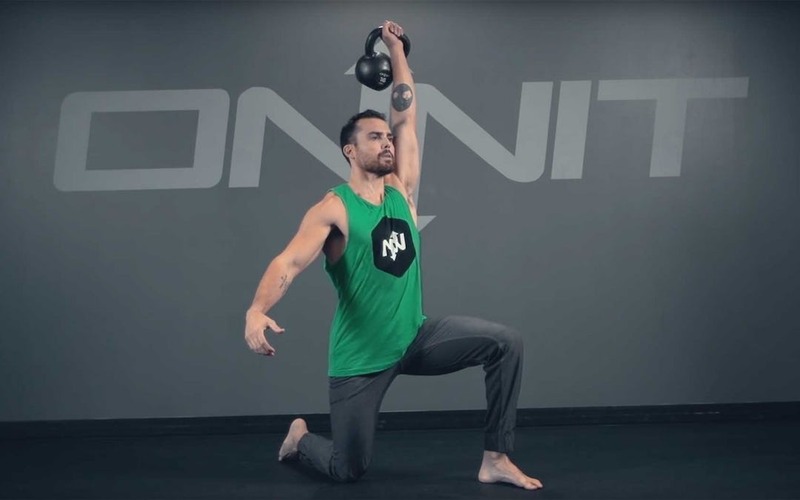 The Half Kneeling One-Arm Kettlebell Press Exercise is a fantastic movement for building shoulder and core strength as it takes the legs out of the movement and puts you in a slightly unbalanced position requiring more attention to each position you go through. Step 2: Squeeze the kettlebell and while keeping your shoulder down press the bell to a lockout position while keeping the distance between your ear and bicep. Step 3: “Pull” the kettlebell down by activating your lats. Tips and Safety: Mind the distance been your knees. They should not be lined up too closely to avoid being too unbalanced. Avoid the “rib flare” by engaging your core (between your pelvis and sternum) avoiding over-extension. Keep your head straight to avoid strain on your neck.